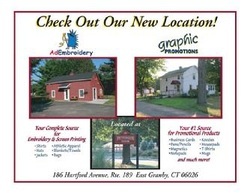 AdEmbroidery is a full service embroidery and screen printing company. We utilize only state of the art equipment and our commitment to serving our clients is unmatched. Our complete in-house digitizing capabilities insure that your custom logo is reproduced promptly and to exacting standards. In addition, we also offer access to over 40,000 stock designs that can be customized for your business or event. No order is too small or too large and our turn around will astonish you! Come and visit us and see how easy it is to put your logo on the garment or your choice! home, office or place of business...just give us a call or drop us an email.